How Will Banks Celebrate the Bull's Birthday This Week? 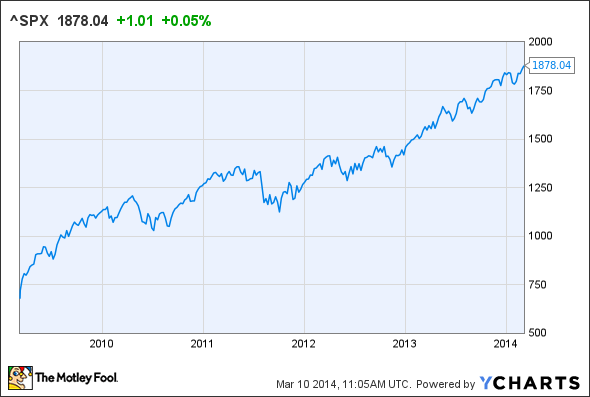 It's been five years since the stock market fell into a ditch; since then it's risen by more than 180%. But that doesn't hold a candle to the gains posted by Wells Fargo, JPMorgan Chase, Citigroup, and Bank of America. Guess who just turned five years old ? That's right, the bull market. Since tumbling down to the sinister level of 666 at one point on March 9, 2009, the Standard & Poor's 500 has soared by over 180% to the present figure.There have been dips and swoons over that time, sure, but for the most part the trend has been overwhelmingly positive. Not surprisingly, since the big banks were some of the most beaten-down stocks of the era (rightfully so, many would argue), they've made some powerful, market-thumping gains since then. Among the nation's big four lenders, the champion's wreath has to go to Wells Fargo (NYSE:WFC), the stock of which has not only grown by the greatest percentage (381%) over that time, it's also risen to its all-time high at nearly $50 per share. If we go by price alone, we can award the runner-up trophy to JPMorgan Chase (NYSE:JPM), whose shares are currently priced at levels not seen since the 1999-2000 dot.com frenzy. Although Citigroup's (NYSE:C) 373% advance and Bank of America's (NYSE:BAC) 362% rival Wells Fargo's in percentage terms, both companies are still -- after all these years -- well below their pre-crisis stock price highs. In those halcyon days, Bank of America traded in excess of $50 per share while Citi often changed hands at a now hard-to-imagine $500-plus. This week, it seems the market might take a breather in the wake of earnings season, so the banks will have to find interesting and creative ways to commemorate the half-decade anniversary. Bank of America, for one, will be collecting a bunch of change it can save up to buy a present. This will be the first full week of the company's new $4.95 per-month Smart Balance checking account, aimed at savers who habitually carry a low balance. There are no overdrafts on the account, which means those customers won't risk at incurring the pricey fees that have attracted the ire of certain regulators. The next few days should provide an indication of how popular the new accounts will be. Whatever Citigroup does to commemorate that crisis-era trench, it'll have to do so with a few prominent lame ducks in its ranks. Last week the company said two of its top managers will depart. Eugene McQuade, chief executive of the core Citibank subsidiary, is to retire in April, while head of consumer and commercial banking operations Cece Stewart is also bowing out at the end of that month. Replacements have been found for both positions, so hopefully the transitions will be smooth and relatively painless. Few market observers, meanwhile, are expecting any special gifts from the macroeconomic store over the next few days. The federal budget is to be published on Wednesday and it'll be bloated and attract plenty of angry criticism, the latest jobless claim figures come down the pike on Thursday and they shouldn't be surprising following last week's release of the most recent unemployment rate. The data for February retail sales will be handed out the same day, likely showing a decline due to this winter's atrocious weather. All in all, it looks as if the banks are going have a rather quiet five-year birthday celebration for their big animal friend. Barring any unforeseen developments, the party shouldn't get too wild and out of hand.